All Galfer Pads and Rotors!! Come on and ride the wave! These unique and distinctive discs are the most cutting edge rotors on the market today. They are designed with efficiency and innovation in mind, with a plethora of benefits over the traditional round set up. NEW: All new Galfer Chrome Carrier Wave Rotors. Finally, Galfer Wave Rotors will be coming for top part numbers with Chrome center carriers. We will stock them and are taking pre-release orders ($40 non-refundable deposit) to order them in your name and have them ship directly from Galfer USA's facility. These will be available for most models & years of: Suzuki **Hayabusa**, GSXR 600, 750, 1000, Yamaha VMAX, TL, R6, FZ1, R1, VSTAR Honda CBR, Ducati immediately. Pricing coming soon but don't delay because these will sell out during April - July! The brake system stays cooler and in contact with the rotor surface. This provides better brake power and lever feel. Their exclusive, unusual design gives a distinct look to your machine. Observers will notice that you have modified your application of rotors. Both front bolt-on and full-floating applications and rear bolt-on rotors are available for hundreds of applications. However, with each different riding application and part number there are also some additional benefits. The wave rotors are designed to work excellent with all brake pad compositions for added cooling benefits. Magazine testing used wave rotors in combination with Galfer HH pads for optimum performance. Although the Wave Rotors were initially designed for weight savings, this will vary by application and may not apply. We are unable to give stock v. wave weight savings for particular models. Sport Bikes, Super Motard & Other Racing: The added amount of trailing edges gives the racer better brake response at first touch of the brake lever. 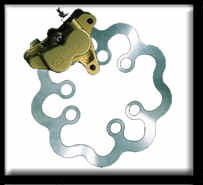 The Sport Bike application rotors by Galfer are race-ready units that perform excellent on the street. 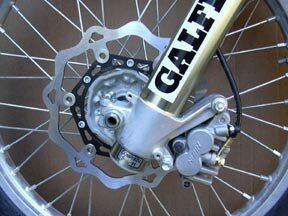 Many top race teams in national and local super-bike races currently use Galfer’s rotors. When you are at the track, stop and ask any Galfer sponsored team what they think about these rotors. You’ll be amazed. It’s likely that you’ll meet a factory representative as well. The Dirt Bike and ATV applications offer self-cleaning action, a lighter rotor and greater cooling. Wave rotors are also great for keeping mud off the surface friction plate, allowing for the brake pads durability to be extended in muddy conditions. These work great with Galfer HH pads for racing applications. Galfer Wave Oversized Rotor Kits include 270mm Wave disc, relocation bracket and semi-metallic brake pads. Nine kits available from Galfer for most off-road applications like Honda CRF, Kawasaki KXF, Yamaha & Suzuki. Please email us at sales@cyclebrakes.com for availability and pricing. MSRP is $289 but sale prices and discounts may apply. 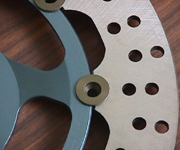 These are perfectly flat rotors made with the best possible materials and technology available, carbon content steel, heat treated to a specific level per application, a definite guarantee of performance. Rear applications are also laser cut and made of same materials. 3) In the SEARCH field/ ENTER part number ("DF070") and ALL styles will pop-up. "Thank you for one of the best e-mail responses I've ever gotten!" Al inquired about his concern of purchasing wave rotors and asking if they would interfere with the ABS system when it engages. plumeria airbrushing. Very happy with my purchases.